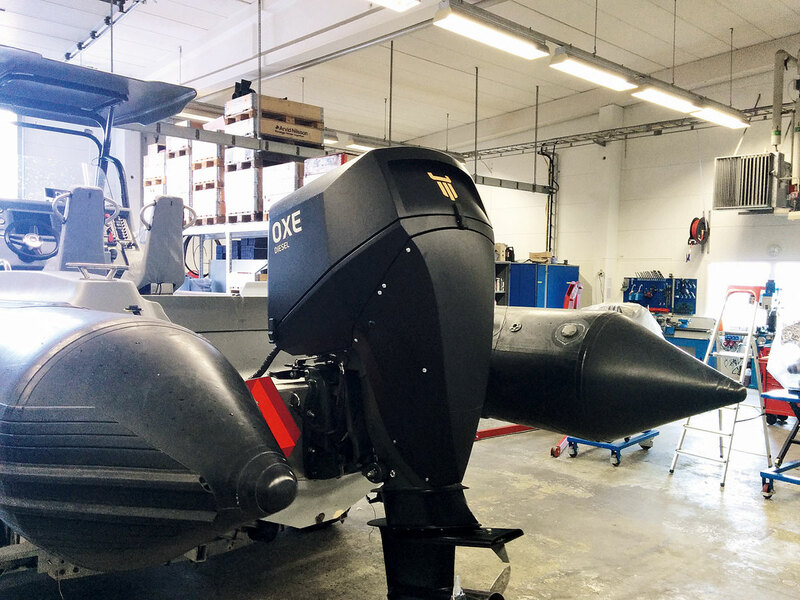 A Swedish company will start selling the world’s first 200hp production diesel outboard motor as early as next year. The Oxe Diesel is based on a heavily modified version of General Motor’s 2-litre turbo diesel engine that is used in the Vauxhall Insignia car. In automotive form, this compact turbocharged four-cylinder unit is available in a variety of power outputs from 140hp to 195hp, but for this application it has been tuned up to 200hp – an exceptional output for an engine of this size. 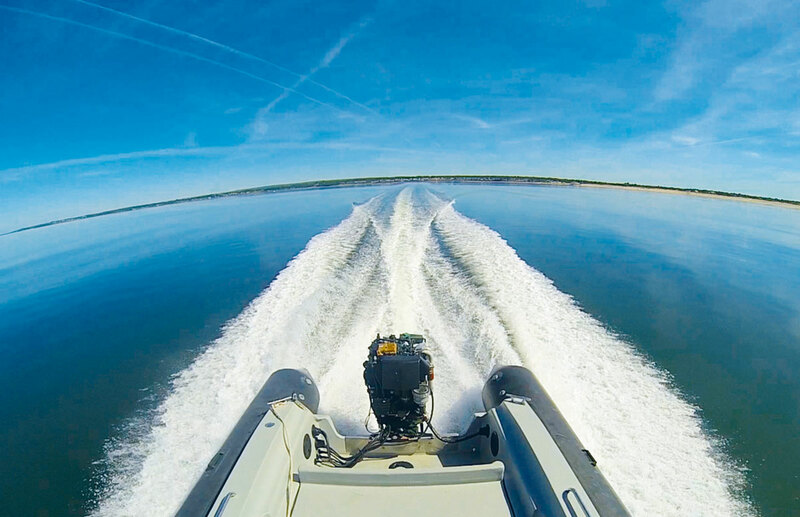 Unlike most petrol outboard motors, the engine is mounted horizontally, giving it a shorter boxier profile than the vertically-mounted V6 blocks which dominate the market for 200hp petrol engines. It also means that power has to be transferred to the hydraulic gearbox below by a toothed belt rather than a direct drive shaft. A second belt then connects the gearbox to the propeller shaft, eliminating the need for bevel gears – a common stumbling block due to the cogs’ limited ability to cope with the higher torque of a turbo diesel engine. This secondary belt drive follows a patented pathway through the lower unit to keep its cross section as slim as possible in the interests of reducing drag through the water and increasing performance and fuel efficiency. The horizontally-mounted engine block also allows for easy servicing and the primary belt transmission pulleys can be changed to alter the gear ratios if required. The gearbox design allows for a twin installation with clockwise or anti-clockwise rotation. The Oxe outboard will be available in shaft lengths of 20in, 25in and 30in, with a wide range of propeller sizes to suit. The weight varies from 280kg to 300kg depending on leg length, meaning a relatively modest penalty of around 25-30kg over an equivalent 200hp V6 petrol outboard such as Suzuki’s DF200. It also meets the new Recreational Craft Directives as well as next year’s Tier 3 emissions standards. The service interval will be 200 hours with a major overhaul at 2,000 hours for heavy commercial use. The price has still to be decided but is likely to be compatible with inboard diesel engines rather than the more affordable petrol outboard engines. This puts it on a par with sterndrive diesel engines, such as Volvo’s 200hp 2.4 Litre Volvo D3. The Oxe-Diesel’s maximum torque output of 258ft/lb (350Nm) at undisclosed rpm can’t quite match the 310ft/lb (420Nm) at 2,000rpm of the Volvo D3, but once the turbo kicks in it should allow for impressively fast and fuel-efficient cruising. The big question is how well its designers have managed to quell the noise and vibration of a powerful 4-cylinder diesel engine without the benefit of a separate engine box to contain it. The Oxe-Diesel is scheduled for launch at the METS show in November with series production planned for 2015. CIMCO is currently setting up a network of sales and service outlets. Mechanical diesel fuel injection – what is it? Mechanical diesel fuel injection has largely been eclipsed by electronic common rail over the last two decades due to improvements in efficiency by common rail injection. Mechanical diesel fuel injection, like common rail injection, is technically called direct fuel injection because it is injected directly into the combustion chamber. Early diesel engines, all the way back to Rudolf Diesel’s very first engine in 1892, used a form of air-blast injection like an aerosol spray to atomise the diesel fuel with air before it entered the combustion chamber. The heart of the mechanical diesel fuel injector is the pump. This is driven from the crankshaft drawing fuel from the fuel tank. The fuel is then pumped to individual fuel lines which feed each cylinder. The timing and duration of the fuel discharge from the pump to each cylinder is crucial, so all the fuel lines need to be of identical lengths to enable this precision. The highly pressurised discharged fuel passes through a spring-loaded injector in the cylinder head. The fuel pressure holds the injector open until it closes when the pulse of fuel pressure stops. Typically this injection process happens around 4° BTDC (4° before the piston reaches the top of the compression stroke). The injected microscopic fuel particles mix with the compressed air in the cylinder. As this air is compressed to around 16:1, the temperature rises above 550°C. This high temperature vaporises then ignites the fuel. In simple terms, more fuel means more energy. Engine speed in a mechanically injected diesel engine is not controlled by a throttle like a petrol engine. Instead, it is controlled by the amount of fuel pumped into the injectors.